Has anyone tried it? Would be super interested to see a review. It is brand new, not even shipping yet I believe. I meant I saw two FB posts of people who received their copies today. I got mine today bundled with the ASI120MM-MINI camera. I plan to use it as a guide cam for now. Lots to learn and lots of connections. I can report that I was able to obtain an image of what my guide scope was pointed at but because it was daylight I wasn't able to do actual guiding with it. I can also report that it recognized my AVX mount and I was able to control the it using Sky Safari 6 plus through the unit. Looks like it may see its first star in a couple days. It worked successfully with my US Cellular LG V-20 running Android 7. I'm going to test it later today or tomorrow with my Samsung Galaxy Tab S2. So far so good. Edited by Queux, 02 October 2018 - 09:06 PM. I can also report that it recognized my AVX mount and I was able to control the it using Sky Safari 6 plus through the unit. Looks like it may see its first star in a couple days. I just received mine this week and have gotten as far as ensuring I get good focus from my 120 mini guide camera at the same time as with my DSLR (using OAG). I am curious: You said it could control the AVX with SkySafari. How did you connect the ASIair to the AVX? I used the phone-like cable and plugged into the “guide” port on the AVX and the port next to the four USB camera ports on the ASIair. Is this right? Will this guide port work for SkySafari? Or did you make a different connection. Also, was there any trick to getting SkySafari to control the AVX through the ASIair? Have you had the chance to guide yet? I’m hopeful that your experience can “guide” mine! Edited by cbecke, 01 November 2018 - 10:22 AM. I received mine last week. Although I haven't had a chance to use it in the field, I was amazed that within a very short period of time I had my Atlas mount, Asi1600mm cool main camera, Asi120mm mini guide camera and EFW mini hooked up and running through my Galaxy Note 9 while sitting in my sun room - I was able to get about 20 to 30 feet away before I had any issue with the Wifi... but that doesn't affect the Asi Air's operations. The app itself is pretty robust - think of it as SGP-superlite without the observatory control. It's a very neat and tidy app that seems to do 99% of what you'd want to do on any given night. Once I finally get a free night that's clear, I'll take it for a test spin outside and report back. 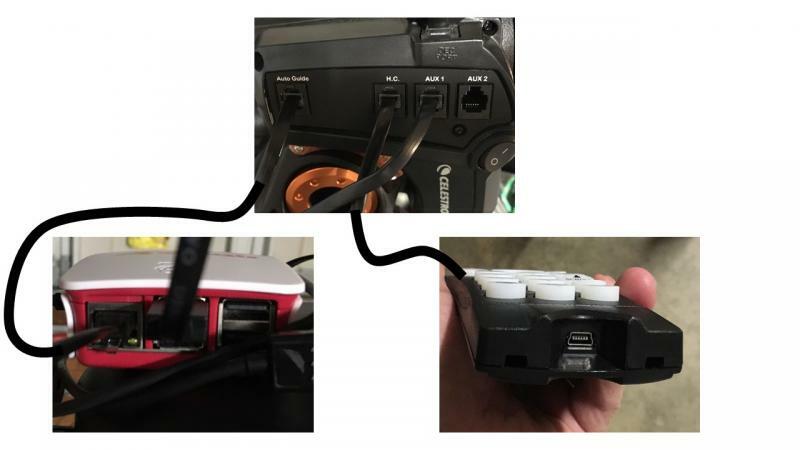 Based on my experience with the Atlas, the ASI Air won't recognize the mount if connecting the guide camera to the guide port on the mount itself - instead you need to connect to the handset directly with the ST4 connection. To the handset port? Or to the handset itself? It appears there's a USB port in the bottom of the handset. Would this connect to one of the USB ports in the ASIair? Or, would the phone-type cord connect between the ASIair and the handset (or one of the aux) ports in the AVX? Currently I have the phone-type connected between the AutoGuide port and the ASIair. The Synscan handset (different from Celestron I believe) has the same ST4 jack on the bottom of it that the mount has for guiding. My guide camera was connected directly to the bottom of the Synscan handset using the "phone jack looking" cord (the USB cord from the guide camera connected to one of the USB ports on the ASI Air). You only connect the ASI Air with a "phone jack cord" if you're connecting to your wireless router to transfer files off the ASI Air SD card if I read the manual correctly. USBs on the ASI Air are the way to connect to all your peripherals. Thank you. When I get a night where I can see some stars, I'll try the USB connection to the bottom of the handset. Luckily I have some extra cords around with that type of connection -- similar to my Canon DSLR. I don’t know if you got this worked out yet, but just in case: Connect the ASIair to the AVX via a “mini USB” cable to the bottom of the hand control. Once you connect your mobile device (in my case an Ipad) to the ASIair wifi, SkySafari can slew the mount for you. You have to toggle back and forth between the ASIair app and SkySafari but it never seems to be a problem. I believe the network cable connector on the ASIair is only useful for downloading data from the SD card to yiur computer, at least in the current version of the software. I havent had more than a couple of chances to try out the device yet but it all worked plug n’ play the first time out, so thats a good start. That port to the left of the 4 USB ports in the ASIair is not an ST4 auto guider port. It is a Ethernet port for a network cable. I've had one for about a month. The interface is amazingly intuitive. Was up and running as quickly as I could get the mount, scope, etc set up. I was concern about the lack of detailed manual but didn't find I needed it. The one tricky part is the cable connections. For the CEM25P, the USB to RS232 to the bottom of the hand controller allows control of the mount. I haven't guided yet so that may still take some learning, but I expect to connect the guide camera to the ASIAir and the telephone cable to the ST4 on the mount.I was able to connect the guide camera but I didn't have a guide scope yet, so no guiding. The file size was slightly different than what I got when capturing with a laptop. It made all my dark and bias useless, but I've already re-done those under the persistent clouds we've had since it arrived. The debayer pattern seemed to be different as well, but a little trial and error with a known color B&W image worked well. I used Trifid. The Plate solving is very fast, less than 10 seconds. I suspect it's because it knows where it is pretty close. I used the ASIAir with the CEM25P and a ES80mm APO triplet. I am already consider a second one for my LX850, although I won't need guiding. Edited by FJQ, 26 November 2018 - 05:32 AM. What are the advantages that justify the ASIAir price considering that it runs INDI (albeit with a different UI) on a raspberry Pi and the same results can be easily achieved with one of the custom INDI/Kstars images available for free? The Astroberry image for instance can be burned on a SD card for free in 5 minutes. Edited by giorgio_ne, 26 November 2018 - 02:14 PM. It's a very simple and easy plug-and-play solution for someone who doesn't have the ability to setup a wireless network otherwise. For those on the very advanced end of the computer/IT spectrum this probably isn't a solution worth purchasing, however for someone like myself (who is computer literate/capable but not an advanced end user) it's a solution that I've always wanted but didn't know how to assemble/configure etc. I admit there’s a documentation problem still affecting many open source initiatives (scattered, not updated or both) but anyone able to use Sequence Generator Pro would not have any issues at also mastering the INDI/Kstars combo. 2. I know the ASIAir doesn’t have focuser control yet, but will in the future. But since ZWO doesn’t make electronic focusers (at least to my knowledge) do we know what focusers will be compatible when that option is added? Will it be the same ones supported by INDI? I don’t mind waiting for this option, but I don’t want to find that a focuser that fits my scope would never be supported. I can answer #1 to some extent, as I've only used it at my house (telescope on patio with me indoors) and haven't yet been able to take it to a dark site on an open field. There are two wireless network options you can choose from - 5G and 2.4G. The 5G option supposed is to have less interference from other local WiFi networks but have a shorter range, with the 2.4G option having a longer range. I'm able to get about 20-25 ft on 5G before I start to notice connectivity issues from inside the house. When using 2.4G I can get about 40-50 ft away before the low signal becomes problematic. I'd venture to guess that being outside at a dark-site without interference from a house, the ranges would be much better. If the ASIAIR is connected to a mount directly, does that mean nothing else can such as SkySafari on iPhone.